First of all: Everyone has ear wax, and as icky as it looks, it’s 1000 percent normal (and necessary). “People think of ear wax as something dirty, but it isn’t,” says Linda Dahl, MD, an otolaryngologist in private practice in midtown Manhattan, and author of Tooth and Nail: The Making of a Female Fight Doctor. Dr. Dahl says that ear wax (or scientifically speaking, cerumen) is a combination of sebum, sloughed-off skin cells from inside of the ear, and secretions from glands in the outer ear canal. It’s designed to seal the very delicate skin that sits above the bone in your ear and act as an antiseptic, says Dr. Dahl. “There’s not a lot of cushioning [in the ear canal],” says Dr. Dahl. “You should aim to have a bit in there at all times,” she says, to ward off infection and keep the area healthy. Is it possible to have too much ear wax? Absolutely. “Almost everyone at one point gets an ear wax blockage where they have a sense they can’t hear or water is getting stuck in there,” says Dr. Dahl. She adds that a lot of her patients don’t even realize that they have a wax problem because it builds up so slowly. She says tell-tale signs of too much ear wax include having trouble hearing, a sense of pressure, popping, ringing, or itching in the ear. Your ear wax will likely get into your ear buds, too. “Look inside—they’re probably filled with wax and blocking the devices,” Dr. Dahl says. What’s the best way to get rid of too much wax? Dr. Dahl says safe ear wax removal can be a lot like a delicate game of “Operation.” PSA: It’s not the cotton swabs themselves that are a problem; it’s how you use them. “When doctors say don’t use Q-tips, it’s a blanket statement. 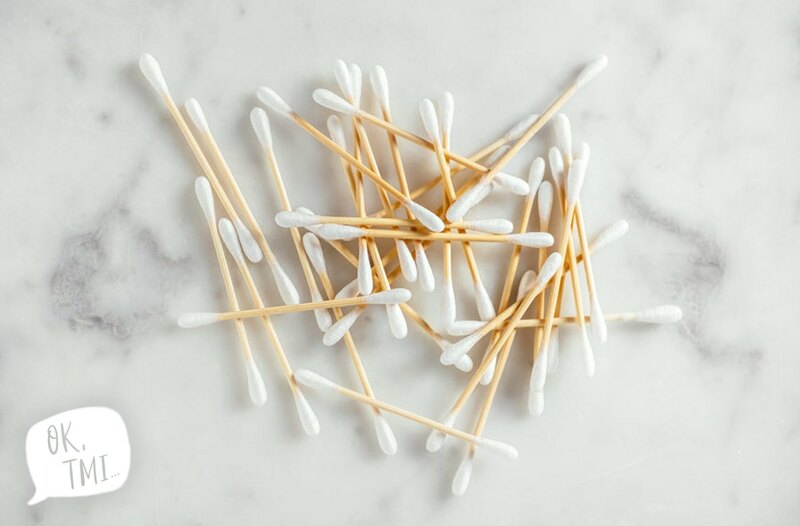 I’m not anti-Q-tip since 99.9 percent of people are doing a great job, it’s just that 0.1 [percent of people] using it wrong or have a small ear canal,” she says. In her view, most people can use cotton swabs to clean their ears. However, Dr. Dahl has a caveat: You can use a cotton swap for ear wax removal. But you really have no idea how far you’re going in, she says (putting you at risk of hitting your ear drum or injuring the delicate tissue inside your ear canal). You might also take out too much ear wax, which could put you at risk of an infection, she adds. Plus, if your ear is full of wax near the canal opening, you’ll just push it back in—defeating the purpose of cleaning them out. To be totally safe, it’s best to avoid them altogether. You can get rid of ear wax at home using a washcloth or towel to gently clean the outside areas of your ears. For excess wax inside your ear, try to avoid sticking anything in there—pay a visit to your doc to help you clean things out safely instead. Please also skip out on DIY candling, despite the temptation of those those can’t-look-away candling videos on Instagram. “What I see is when people use the candle when they have a lot of wax, it melts on the eardrum, so I need to go out and pick it out,” Dr. Dahl says. Um, yikes? So to recap: Ear wax is totally normal. But if what you’re rocking in your ear is getting in the way of your life, you should see a pro about cleaning it out safely. Your Air Pods will thank you! Can’t get enough wax? Here’s what the color of yours says about your health. And for more TMI, here’s what to do if your tampon ever gets stuck.